This is a Victorian hand-made beauty! This tiny (approx. 2.5 by 2.25 inches) crochet bead work purse is in a riot of pink shades. 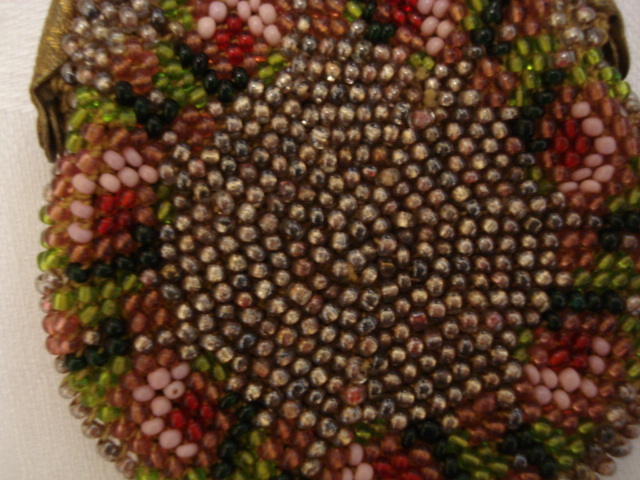 It has a mink brown background colour dotted with pink and green flowers all around. The pattern is repeated on both sides. Inside the thread has turned a 'ginger' colour which is very old and pleasing to the eye. You can clearly see the neat crochet stitches .The lady who made this was very clever indeed; she has worked a dozen of the beads onto a thread inside and I think this would be in case she needed to repair it in the future, a bit like getting a spare button in your garment today! Well she didn't need to use those seed beads as it is still in excellent condition today. 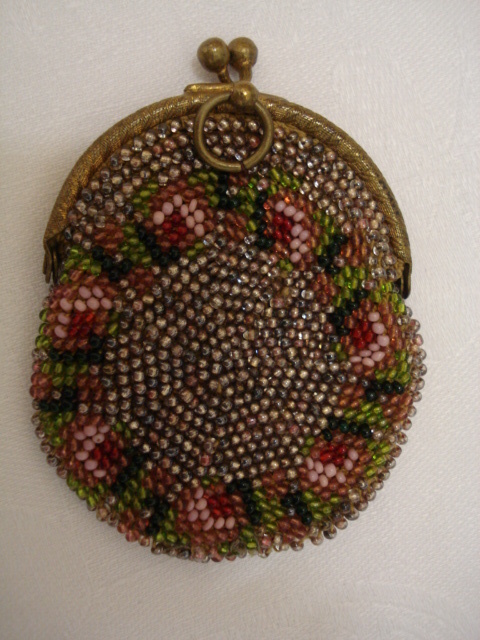 It may well be that our Victorian beader found the pattern for this purse in a popular needlecraft magazine of the day! Mademoiselle Riego de la Branchardiere was credited with the introduction of crochet as a craft into Britain. She could be described as a 19th Century journalist, writing for ladies magazines of the period. She brought out 'The Needle' publication between 1852 and 1853 and published instructions and patterns for all kinds of needlework. 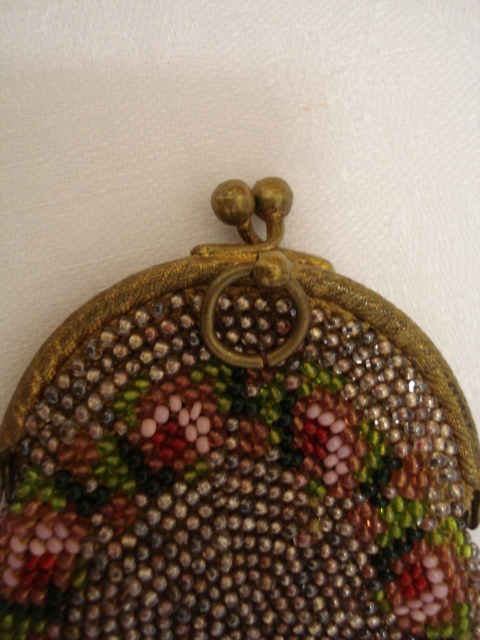 Crochet work ,like this little antique purse ,required beads to be threaded onto crochet silks and then worked into a design. Well this purse has a patterned gilt metal frame with a 'kissing' type clasp and a ring so that it could be fixed to the Chatelaine. The word 'Chatelaine' also comes from France. The French for wool is 'laine' and house or mansion is 'chateau'. So you can see how the keeper of the keys to the linen closet or armoire where valuables were stored became known as the Chatelaine. And the meaning eventually transferred from the person to the object! Chatelaine hooks were originally worn over garments in the 12th Century and had the keys suspended on them. Later the Chatelaine, basically an ornamental hook,clasp or pin worn at the waist of the mistress of the house, sported a series of chains from which objects such as a pomanders, keys, watch, purse, trinkets and sewing implements were hung ready for use. The size of this purse would have made it just right for a Sovereign or even for your Penny for the church collection plate. 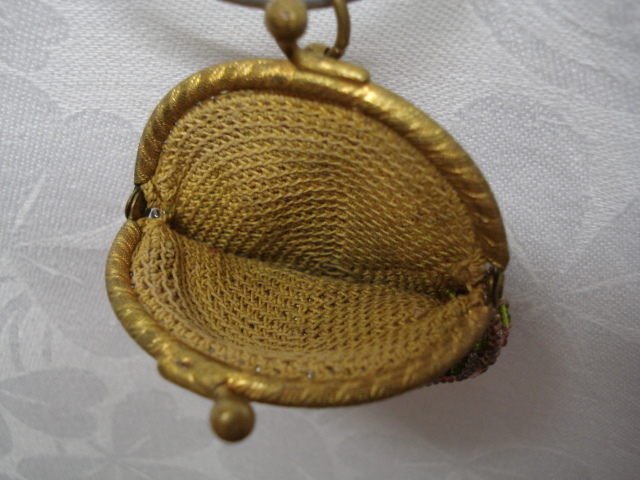 This tiny size of purse can be known as a 'Sovereign' or 'Penny' Purse too! What a super addition to your antique beadwork, your vintage bag, novelty or miniature purse collection this would be!